I hate ironing and I think we pretty much all do. It takes forever to constantly adjust shirts and pants around to find the best angle to iron them. Well, finally, the ironing board has entered the 21st century with a modern redesign to not only save up to 80% of ironing time but also make the entire process easier and much, much more enjoyable. The cool new Flippr is an innovative torso-shaped ironing board with 360 degrees of rotation. Just slip a shirt over the removable cotton cover, iron, flip it over, and iron the other side. For pants, just use the built-in clips to securely attach and help stretch them flat. 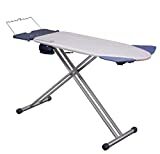 It features eight adjustable heights, a removable mini detail board for ironing collars and sleeves, a foldaway iron rack, and wheels to roll it away until next time. Check out the video demo below to see it in action. Cool huh?